Artificial Intelligence is transforming the retail experience. But to future-proof an industry that is already being hard hit by its customers’ digital migration, AI must serve a purpose and deliver meaning – for both customer and business. Here are five areas where companies are seeing an immediate return on value. We all want convenience, but convenience which is personal. AI is making that possible. With the right data, companies can react to our shopping habits and offer us more of the right things at the right time. We are seeing a shift from personalisation to individualisation, from transactional to relational. Being able to actively monitor, capture and understand a consumer’s shopping behaviour to offer tailored recommendations based on the purchase rhythm of the consumer builds loyalty. Take Rappi, a well known Latin American delivery unicorn that brings you anything from takeaways to groceries to cash for $1 a trip. With over 5m downloads of the app and a 20% monthly rise in users, it is building a brain that can predict differentiated user needs. So for example, if you often order in beer at 5pm on a Friday, Rappi will check in with you at that time of the week and ask if you want to repeat buy. Chances are you do. And if not, the machine learns to recognise you as a fortnightly beer drinker not a weekly one. Along the lines of individualisation, a business that understands its consumers knows what interests them, and more importantly what doesn’t. Millions of pounds are lost in marketing activities that blast out irrelevant offers to consumers. Why send a nappy advert to a consumer with no children? Or a holiday getaway temptation to someone actively searching for a house? There are so many examples of poor targeting and lost opportunities. Businesses that take time to understand and use the data they gather have an opportunity to create highly personalised, tailored services for their customers. This makes customers more inclined to believe the business knows them and their current interests and mindset. Many businesses have introduced chatbots and virtual assistants into their websites. With this comes 24-hour-a-day availability and personalised services to help enhance the customer shopping experience. These types of AI services not only improve the customer experience, but also differentiate retailers. For inspiration, check out Lidl’s Facebook chatbot, Margot. She (or it) helped Lidl grow their wine sales by 23% in 2017, with growth continuing last year. Meanwhile, Marks & Spencer’s virtual assistant helped save the retailer £2.5m in online sales and filled an immediate customer service gap for its online shoppers. With location-based services on the rise, more and more businesses are using data to offer consumers the right product, at the right time, in the right location. Being able to actively offer food at lunch time, or advertise a targeted product while a consumer is in-store, allows businesses to capture an opportunistic purchasing moment. A good example of a location-based AI service done right is the GasBuddy app that provides customers with real-time fuel prices as well as payment and loyalty related services, on-demand and based on the consumers current location. The concept of a digital twin is well established within manufacturing. Acting as a physical product within a digital context, manufacturers are able to simulate its production. This allows them to make adjustments throughout the production process, before the virtual product is constructed into physical reality. As a result, processes are streamlined to save product time and costly mistakes avoided. In the context of retail, the digital twin is still relatively new, but it’s gaining momentum as more and more Internet of Things products hit the market and AI capabilities become mainstream. Businesses are able to capture, analyse and leverage data in real-time in order to actively evolve their products. Adidas is a great retail example—not only have they leveraged a digital twin to enhance their manufacturing, they are also using it to directly connect with their consumers via the products they purchase, the experiences they have and the feedback they give. Adidas actively seek out opportunity to pull in data from multiple sources in order to gain a better understanding of their consumer and create a value proposition across their entire supply chain. From manufacturing to distribution, from sales to customer use, Adidas is just one example of how businesses are accelerating the pace in which their products are designed, manufactured, sold and enjoyed by their consumers through the growing use of AI. As retailers race to embrace AI, those who put their deep understanding of customers’ wishes and motivations at the heart of their improvements are the ones who are seeing their businesses thrive. 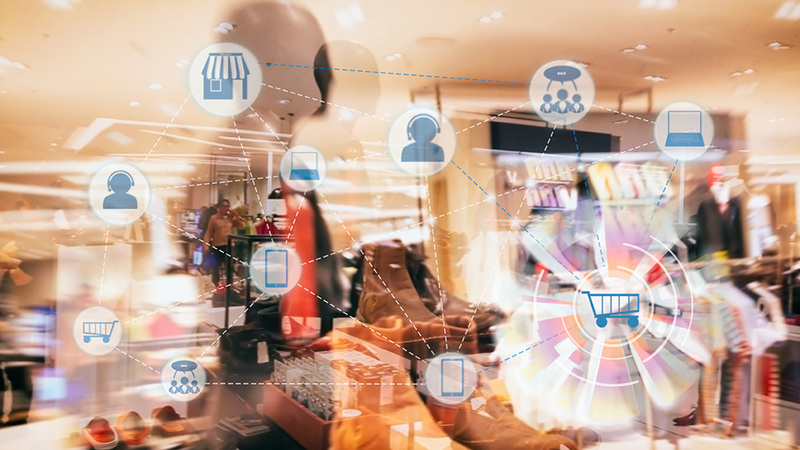 Check back next week when we explore how AI can potentially go wrong in retail, in part 2 of our Retail and Artificial Intelligence blog series.